Parties led by Ukraine’s PM and president are in the lead, now that half of the Sunday parliamentary elections ballots have been processed. Several southeastern regions have however given the majority of votes for the Opposition Bloc. With 50.08 percent of ballots having been processed, PM Arseny Yatsenyuk’s People’s Front party is ahead of rivals with 21.61 percent of votes, according to Ukraine’s Central Election Commission (CEC). 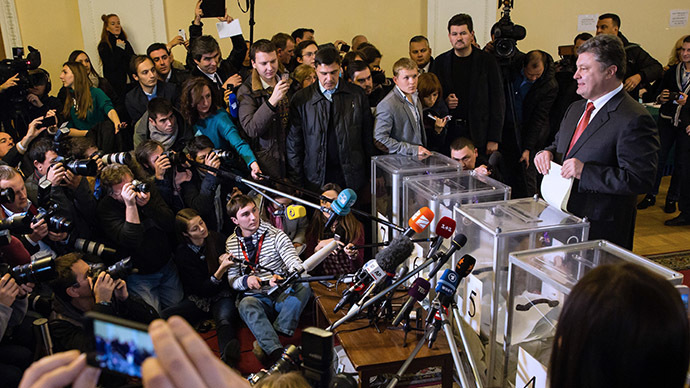 The president’s Petro Poroshenko Bloc is only slightly behind, so far garnering 21.45 percent. The two parties have already launched negotiations on forming a coalition, according to the head of the Poroshenko Bloc, Yury Lutsenko. “We have recently started talks with the People’s Front”, he said as cited by RIA Novosti. “There have taken place consultations between the president and the prime minister, and there’s an expanded meeting of representatives of the two political forces planned for today." The CEC also announced that only four other parties have passed the 5 percent threshold thus far. The parties making it into the Ukrainian parliament are the Samopomosh of Lvov's Mayor Andrey Sadovy (11.10), Opposition Bloc (9.82), Radical Party of Oleg Lyashko (7.38), and Yulia Tymoshenko's party Batkivshchina (Fatherland) (5.69). Despite the overall parliamentary vote being led by the parties of the Ukrainian president and prime minister, described as the pro-EU ones, several regions in the southeast of the country demonstrated a different trend. The Opposition Bloc, headed by former Deputy Prime Minister Yury Boiko, is ahead in the Kharkov, Lugansk and Zaporozhye Regions, according to preliminary data by Ukraine’s Central Election Commission. In the Dnepropetrovsk and Donetsk Regions the Opposition Bloc is also leading the vote count in several election districts. International exit polls earlier predicted a win for the Poroshenko Bloc, saying the party was supported by 23 percent of voters. 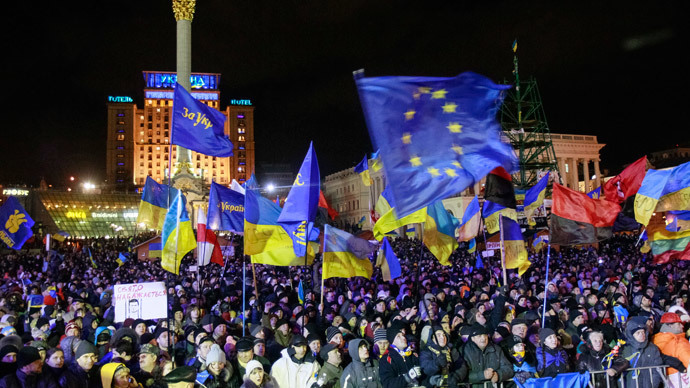 "We can say today that a third of voters support the president's course for carrying out reforms for entering the European Union," said Yury Lutsenko, leader of the Poroshenko Bloc. Moscow considers the Ukrainian parliamentary elections valid, according to Deputy Foreign Minister Grigory Karasin. “We are waiting for official results. So far quite controversial information has been coming. But even now it’s clear that elections, despite quite tough and dirty campaign, have been valid,” Karasin told Interfax. “The balance of forces that is emerging will likely allow the Ukrainian leadership to engage in thoroughly solving the core national problems,” he added. 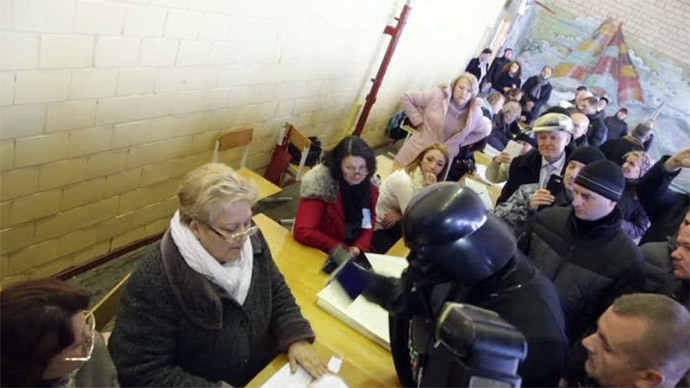 Ukrainians voted Sunday to choose from a total of 29 political parties. A party has to pass the threshold of five percent in order to be represented in the Verkhovna Rada. Half of the seats in the 450-member parliament will be filled by the leading blocs, while the other half will be filled by candidates running in single-member constituencies. However, voting did not take place in the eastern part of the country in the self-proclaimed People’s Republics of Donetsk and Lugansk. Authorities of these regions stated they would not go to the polls and plan to hold elections of their own heads and parliaments on November 2.